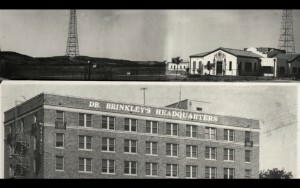 "[Brinkley] maintained a pay roll estimated at between $17,000 and $20,000 [in Del Rio] . . . he thought the high school should have a business course and donated the desks, typewriters and other equipment. He provides candy and fruit for every child in Del Rio at a Christmas party each season. When the Rotary Club sought to increase its student loan fund, he offered to match it . . . He offered $25,000 cash if the city would cause a similar amount for a public library to be raised" ("The Case of Brinkley v. Fishbein", Journal of the American Medical Association, May 13, 1939, Volume 112, No. 19, p. 1952).